For the mainland Chinese academy formerly known as Academia Sinica, see Chinese Academy of Sciences. Academia Sinica (AS; Chinese: 中央研究院; literally: 'central research academy'), headquartered in Nangang District, Taipei, is the national academy of Taiwan. It supports research activities in a wide variety of disciplines, ranging from mathematical and physical sciences, to life sciences, and to humanities and social sciences. As an educational institute, it provides PhD training and scholarship through its English-language Taiwan International Graduate Program in biology, agriculture, chemistry, physics, informatics, and earth and environmental sciences. Academia Sinica is ranked 144th in Nature Publishing Index - 2014 Global Top 200 and 22nd in Reuters World's Most Innovative Research Institutions. The current president since 2016 is James C. Liao, an expert in metabolic engineering, systems biology and synthetic biology. Emblem at the main entrance. As the most preeminent academic research institution in Taiwan, Academia Sinica is directly responsible to the Presidential Office, unlike other government-sponsored research institutes which are responsible to relevant Executive Yuan ministries. Thus AS enjoys autonomy in formulating its own research objectives. In addition to academic research on various subjects in the sciences and humanities, its major tasks also include providing guidelines, channels of coordination, and incentives with a view to raising academic standards in the country. Academia Sinica has its main campus located in Nangang District of Taipei City and runs over 40 research stations distributed across the country and throughout the world. The main campus in Nangang was constructed in 1954. In addition to the Central Office of Administration and 28 institutes and research centers, the main campus has 10 museums or memorial halls open to the public, as well as an ecological pond, a forest park, a temple of Earth God (Fwu-Ter temple), and the Sih-Fen Brook (四分溪) that runs through the campus and in the north by the National Biotechnology Research Park. The National Biotechnology Research Park, finished in 2017 and inaugurated in October 2018 by the Taiwanese President Tsai Ing-wen, is located about 500 m north of the main campus and 500 m south of the Nankang Software Park, with the Nangang station to the west and the Taipei Nangang Exhibition Center MRT station to the east. It is home to four Academia Sinica centers for translational medicine, innovation, incubation, and bioinformatics service, as well as the Biotechnology Development Center of the Ministry of Economic Affairs, the Food and Drug Administration of the Ministry of Health and Welfare, and the National Laboratory Animal Center of the Ministry of Science and Technology. Three physical sciences institutes, Mathematics, Astronomy, and Atomic and Molecular Sciences, are located in the main campus of National Taiwan University in Gongguan, Da'an District, Taipei. A joint office between the two institutions was established in 2014. A campus in the Shalun Smart Green Energy Science City, near the Tainan High Speed Rail station, Guiren District, Tainan, is under construction and is expected to be finished in 2021. The groundbreaking ceremony took place in May 2018 after seven years of planning. The Southern Campus is part of an effort to promote regional balance in the academic landscape of Taiwan and will prioritize research on agricultural biotechnology, sustainable development, and archaeology of early Taiwanese history and culture. The Academia Sinica was founded in 1928 in Nanking, Republic of China, with the first meeting held in Shanghai. After the establishment of the People's Republic of China in 1949, it relocated to Taiwan. In 1954, its main campus was constructed in Jiouhjuang, Nankang, Taipei. The institutes at that time were Mathematics, Philology, and Botany. The second Convocation was held in 1957. In the 2000s, many of the current institutes and research centers were established, partially through reorganization of the old ones. The first PhD program of the AS, the Taiwan International Graduate Program, was inaugurated in 2006. Life Science Road (from right to left: Institute of Biomedical Sciences, Institute of Molecular Biology, and Institute of Biological Chemistry). Institute of Plant and Microbial Biology and Agricultural Biotechnology Research Center. In general Academia Sinica is a non-teaching institution, but it has very close collaboration with the top research universities in Taiwan, such as National Taiwan University, National Tsing Hua University, National Chiao Tung University, National Yang-Ming University and National Central University. Many research fellows from Academia Sinica have a second appointment or joint professorship at these universities. In addition, Academia Sinica established joint Ph.D. programs in biological sciences with Taiwan's universities, such as the Doctoral Degree Program in Marine Biotechnology with National Taiwan Ocean University. Through these mechanisms, the faculty at the Academia Sinica give lecture courses and supervise graduate students. One of the dormitories for TIGP students and their families. Since 2002, Academia Sinica set up the Taiwan International Graduate Program (TIGP), open to local and international students for Ph.D. programs. All courses at TIGP are conducted in English. Students can choose their advisor among a faculty selected for the program out of outstanding researchers and professors appointed at Academia Sinica or at one of the partner universities (or both). Currently, admittance to the programme guarantees a monthly stipend of 34,000 NTD, roughly $1,200 or €1,050. Applications can normally be sent starting in December and the submission deadline is usually set on March 31, for enrollment in September of the same year. Lectures start around the middle of September and end around the middle of June, with slight variations mostly depending on the partner university's academic calendar. Launched in 2009, the TIGP-IIP is an intensive, predoctoral, summer research training program for two months that prepares its participating interns with the necessary knowledge and skills for future research or career development through rigorous hands-on training. Successful applicants from around the world will receive for each month a stipend of 30,000 NTD and a round-trip ticket to Taiwan. The program highlights include internship at an applicant-chosen host lab, visits to Academia Sinica facilities and partner institutions, field trips in Taiwan and basic Mandarin lessons. Many institutes of Academia Sinica offers their own summer internship programs for undergraduate students in Taiwan. Academia Sinica also offers a three-year program for gifted and talented high school students interested in the biological sciences. To enroll, students must first pass an entrance exam at the start of 10th grade (first year for Taiwanese senior high schools). During 10th grade, students attend expert lectures and visit the various laboratories on campus. During 11th and 12th grade, students enter a lab of their choice and gain hands-on experience in the various fields of biological sciences. To graduate from the program, an academic paper must be submitted and presented in front of professors and peers. (Left to right) President James C. Liao, president of Taiwan Ing-wen Tsai, and vice president of Taiwan Chien-Jen Chen at the 32nd Convocation Meeting. The Convocation of the Academia Sinica consists of 281 Academicians, including 105 domestic and 176 overseas appointed scientists. Seven Academicians of Academia Sinica are Nobel laureates. Academician membership is an honorary lifetime privilege without remuneration. They do not necessarily perform research or reside at the Academia Sinica campus. According to their own expertise, academicians are grouped into three divisions: Mathematics and Physical Sciences, Life Sciences, and Social Sciences and Humanities. A maximum number of ten new members is allocated to each of the three divisions during the biennial Convocation. The eligibility of the academicians is not restricted to the residents of Taiwan or ROC citizens. More than half of the academicians are overseas scholars and scientists. At the Convocation, the academicians elect new academicians and honorary academicians, and elect members to the Council of Academia Sinica. The Convocation can also recommend policies to the government on academic research. The academicians also have responsibilities to carry out research at the government's request, although the government has never requested any task. 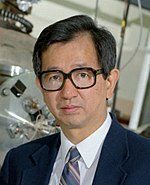 Yuan T. Lee, Nobel laureate in Chemistry, academician and former president. The president of the Academia Sinica is appointed by the President of ROC from three candidates recommended by the Council Meeting. The president of the Academia must be an Academician. After the appointment, the president serves a five-year term and can serve up to two consecutive terms. Academia Sinica's current President is James C. Liao, a biochemist, who replaced Chi-Huey Wong, a biological chemist and the Parsons Foundation Professor and Chair of the Department of Chemical and Biomolecular Engineering at the University of California, Los Angeles, as the 11th president on 21 June 2016. The list of past Presidents also includes Hu Shih, a philosopher and essayist, and a key contributor to Chinese liberalism and language reform in his advocacy for the use of vernacular Chinese, as well as an influential redology scholar and holder of the Jiaxu manuscript (Chinese: 甲戌本; pinyin: Jiǎxū běn) until his death. The fifth president, Yuan T. Lee, won the Nobel Prize in Chemistry for "contributions to the dynamics of chemical elementary processes". The institute has extensive cooperation with research and academic institutions from other countries (such as Harvard-Yenching Institute) and hosts several foreign institutes and their scholars. The Taipei Center of the French EFEO (L'École française d'Extrême-Orient; French School of Asian Studies) was hosted by the Institute of Modern History, AS, from 1992 to 1996 and since 1996 by the Institute of History and Philology. Its research projects center on the local and cultural history of Taiwan and China, and it organizes conferences and talks, support visiting scholars and students, and hosts EFEO fellows. ^ a b "Academia Sinica E-book". ^ 中央研究院 常見問題集：三、在中研院工作的人都是中研院院士嗎？. Academia Sinica. ^ 立委質疑中研院定位不明 廖俊智以開飛機巧妙回應. LTN News. ^ a b c d Taiwan International Graduate Program, Academia Sinica, Taiwan. ^ "World's Most Innovative Research Institutions". ^ "Google Scholar profile of James C. Liao". ^ a b "National Biotechnology Research Park brochure" (PDF). ^ a b "Expanding R&D capacity into southern Taiwan, the Southern Campus of Academia Sinica officially breaks ground". ^ "Institute - Max-Planck-Institute". Max-Planck-Gesellschaft. Max-Planck-Gesellschaft. 2017. Retrieved 12 March 2017. ^ Convocation of the Academia Sinica, Academia Sinica, Taiwan. ^ Nobel Prize laureates, Academia Sinica, Taiwan. ^ "Academia Sinica Handbook for International Scholars" (PDF). Retrieved 12 July 2017. Wikimedia Commons has media related to Academia Sinica.